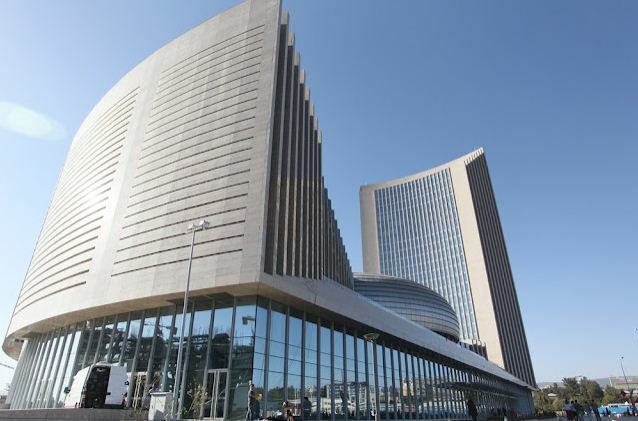 As an African I beg you to form a high level committee and a senior department within the AU to study; inform member states; document; and respond to the obvious collective policies and practices of European mega-criminals, in all continents, who became the world super-rich and big corporations. These acts are ferociously destroying any efforts to maintain peace; liberation; development; and health in Africa and the world. I am sure these are your top priorities and obligations. Please reign bureaucracy and act decisively and swiftly because each day of destruction requires years of reconstruction. 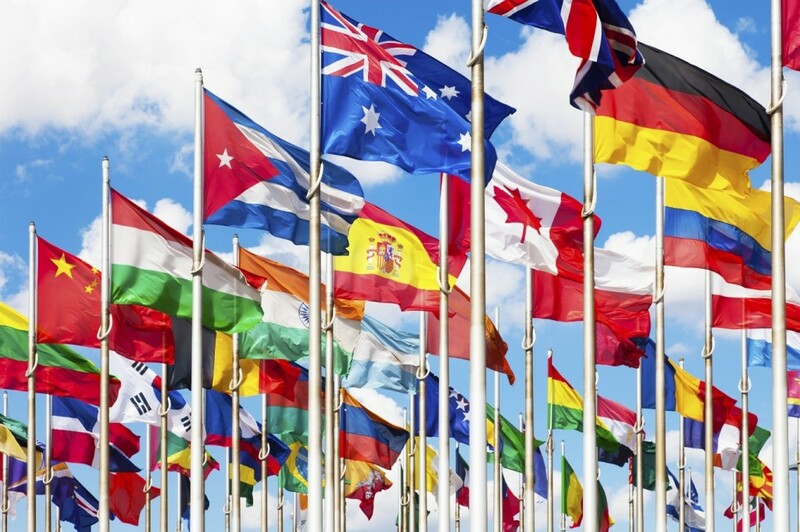 Increasingly in modern history, the tactics of the European mega-criminals, in all continents, who became the world super-rich are systematic and highly organized. It is still being carried out now in Africa; Arabia; Latin America; and the entire “New” World. First, they send “explorers”, “missionaries”, “volunteers”, “researchers”, “aid workers”, “consultants”, or “businessmen” to gather vital information. Then they create companies for oil, minerals, pharmaceuticals, and even banana, or cocoa, and the like. 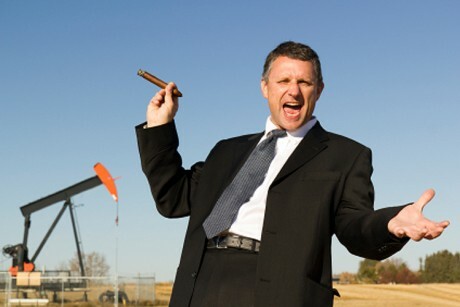 They identify and target regions with natural wealth to hit it hard. 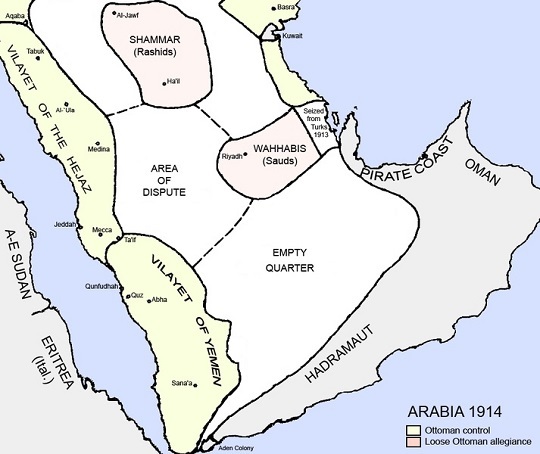 If a wealthy region is within the homeland of tribe “A”, they screen and pickup a ruthless criminal from a neighboring tribe “Z”. In addition to such investment European criminals offer monarchs; head of states; members of government and media a lot of lucrative “incentives” to legitimize the assaults and atrocities of their agents on the wealthy region. Suddenly, the imposed war shall be regarded as inevitable campaign for unification; state-building; civil war; protect civilians; bring democracy and civilization; protect the faith and minorities; fighting Communism; or any other rubbish pretext. The merciless assaults should end up by installing the local criminal agents and their tribe on top of an artificial but “legitimized” state. Tribe A, the owner of natural wealth, shall get next to nothing; while tribe Z shall get modest rewards from the official loot. But the shares of local criminals are kept in separate accounts in European banks owned by the same European criminals who own the companies. And to add more theft on top of the original robbery the “Government of State Z” is ordered to buy huge amounts of unneeded weapons; services; projects; and merchandise from their European masters. Now “state Z” is under constant embezzlement by making them feel deeply insecure and threatened from the legitimate owner of wealth, tribe A, and also from foreign states so they are trapped and have no escape from cooperating with their European masters. 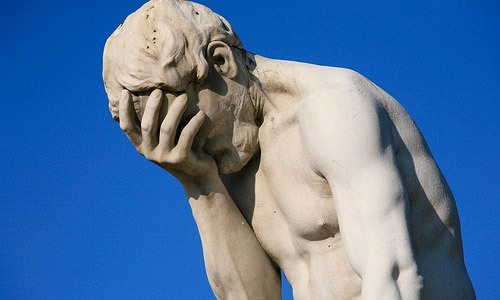 Trust in the European Union has fallen since autumn 2011 and now stands at its lowest ever level (31%, -3 percentage points). At the same time, levels of trust in national governments and parliaments have recovered slightly (28%, +4 and 28%, +1 respectively). 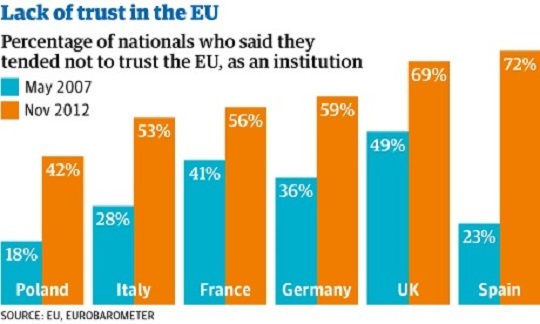 As a result, the gap between trust in national political institutions and the European Union is now very narrow. 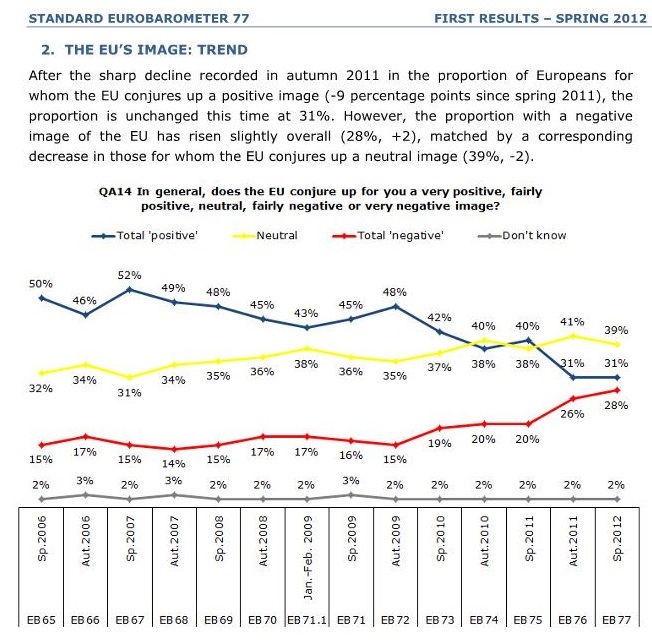 After the sharp decline recorded in autumn 2011 in the proportion of Europeans for whom the EU conjures up a positive image (-9 percentage points since spring 2011), the proportion is unchanged this time at 31%. However, the proportion with a negative image of the EU has risen slightly overall (28%, +2), matched by a corresponding decrease in those for whom the EU conjures up a neutral image (39%, -2). More than half of Europeans support a European economic and monetary union with a single currency, the euro (52%, -1 percentage point since autumn 2011). 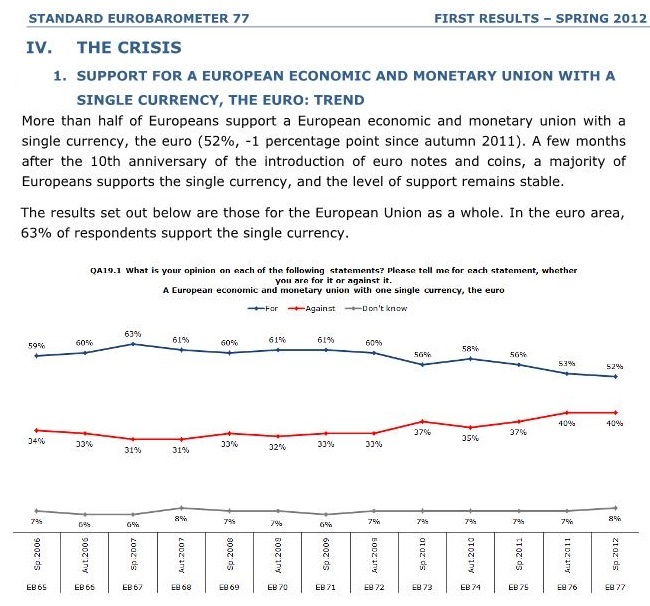 A few months after the 10th anniversary of the introduction of euro notes and coins, a majority of Europeans supports the single currency, and the level of support remains stable. The results set out below are those for the European Union as a whole. In the euro area, 63% of respondents support the single currency.